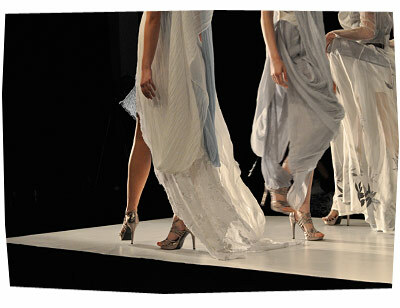 The latest fashion graduates from Curtin University showcased their final collection at Curtin Stadium last month. 1. I adored the boofy Victorian silhouette and the delicate, textured fabric of the dress from Rebecca Vandermeulen’s collection. 2. 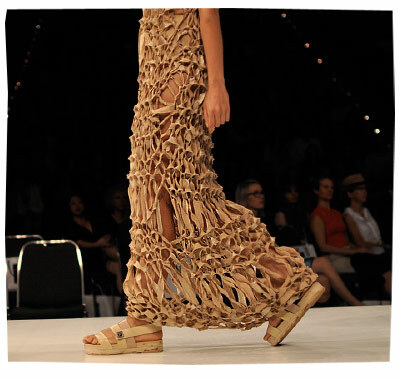 Models frozen in an awkward mid-step, look like they are dancing on the end of the catwalk. Creations by Naomi Randall. 3. Knitted, knotted, tangled beauty from Mallory Maduka-Ike’s “Chrysalis” collection. 4. Again, I was drawn to the knotted awesomeness by Jayde Christie. 5. Tia Tokic’s “Bacterium” collection was a stand out; her garments were visually striking with a strong concept, and they were very entertaining to see on a catwalk (thus memorable). But even more so – when I looked closely at her handiwork – I was completely inspired by her meticulous crafting skills. I’d like some Bacterium bed slippers thanks! 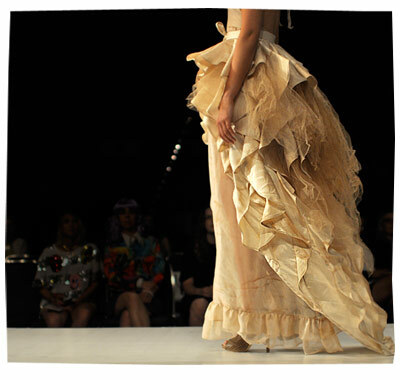 View all photos from the Curtin Zenith Fashion Show via Songy Knox Photography. « 25 Day Fitness Challenge – Done and Dusted!